Something for minutiae fans now. 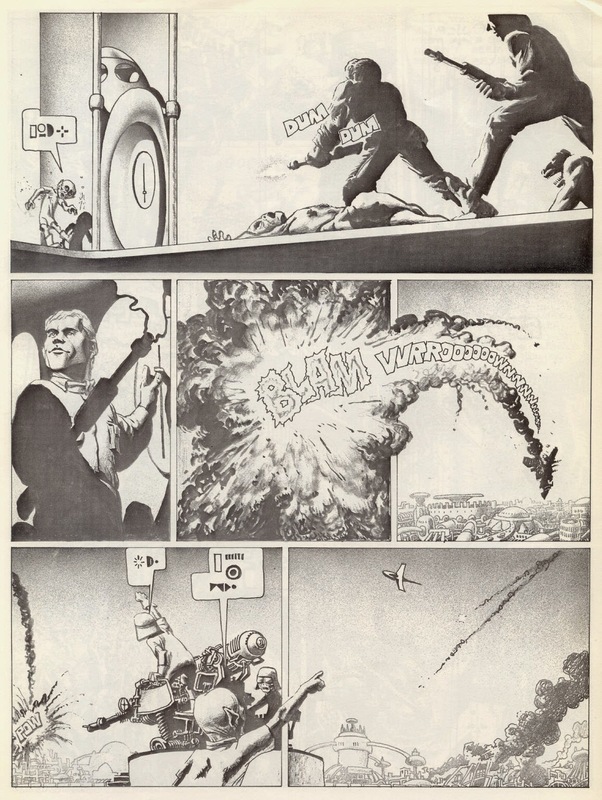 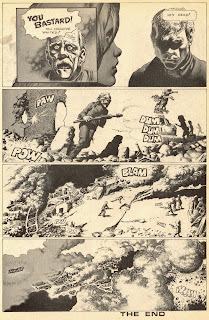 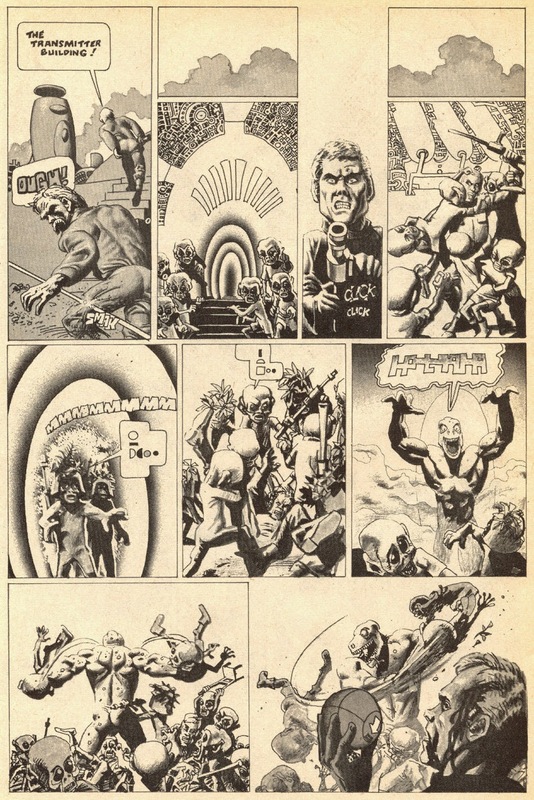 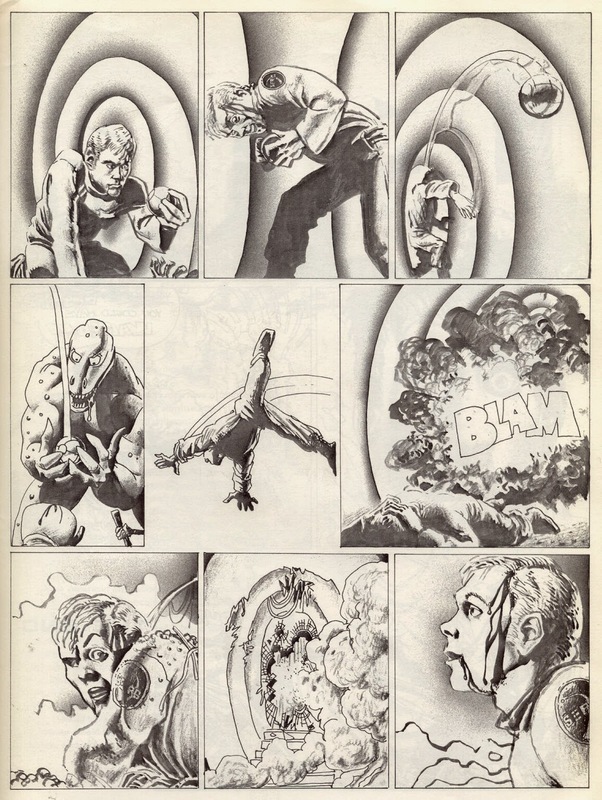 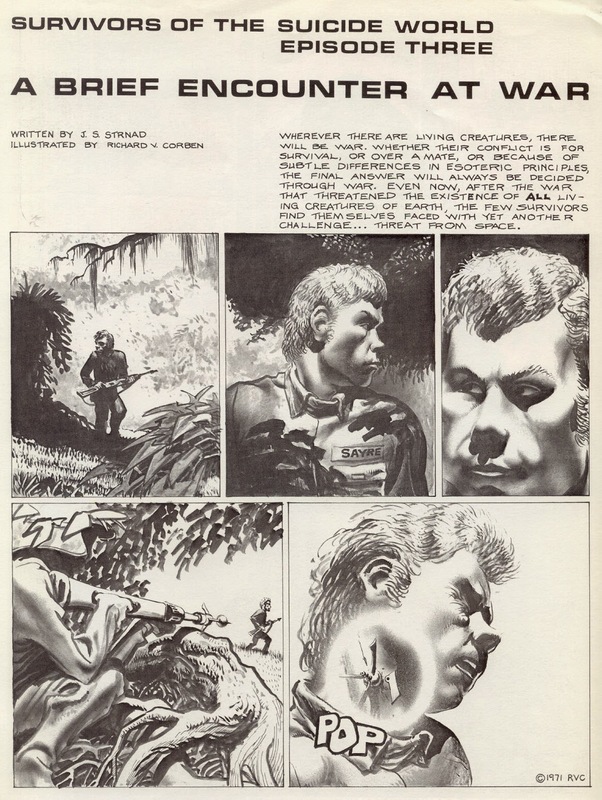 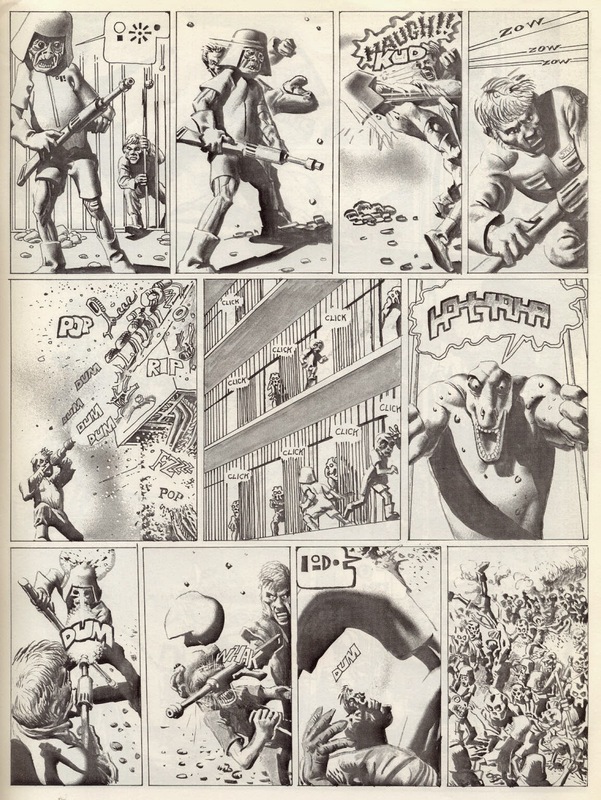 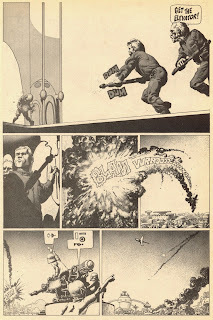 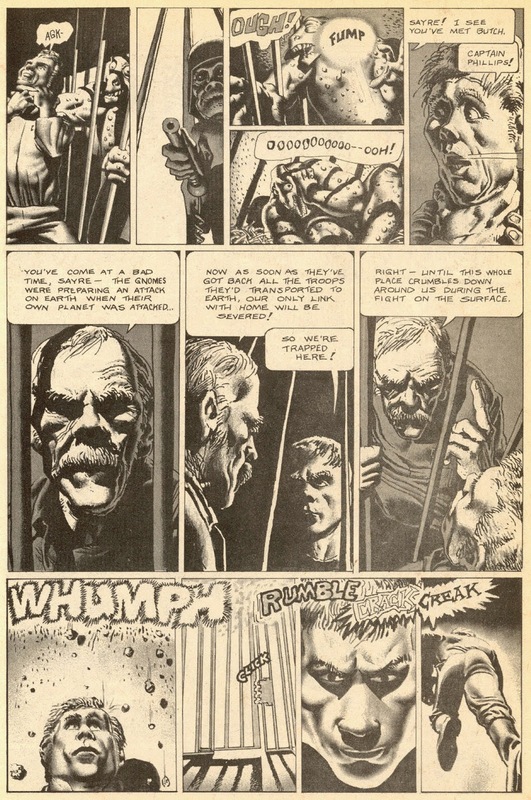 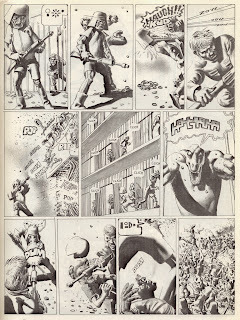 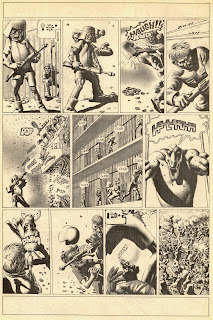 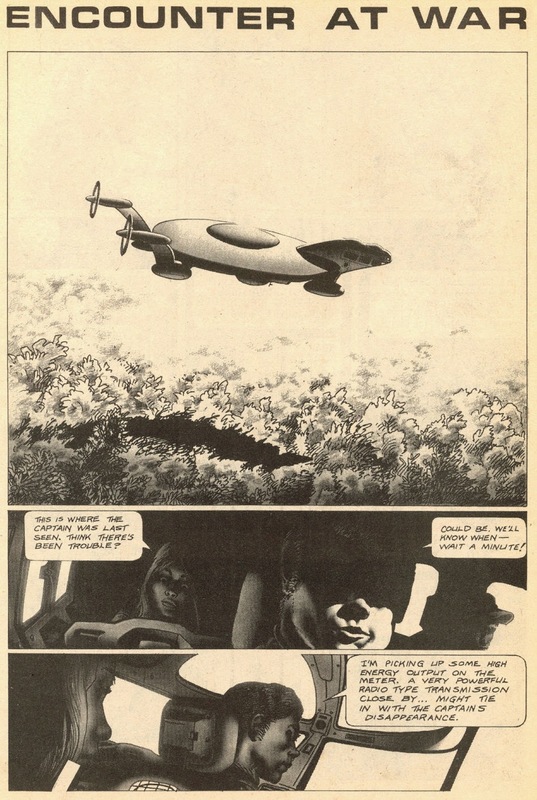 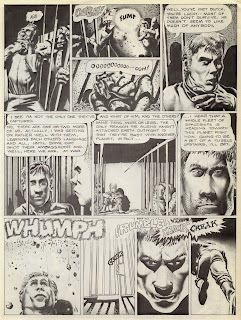 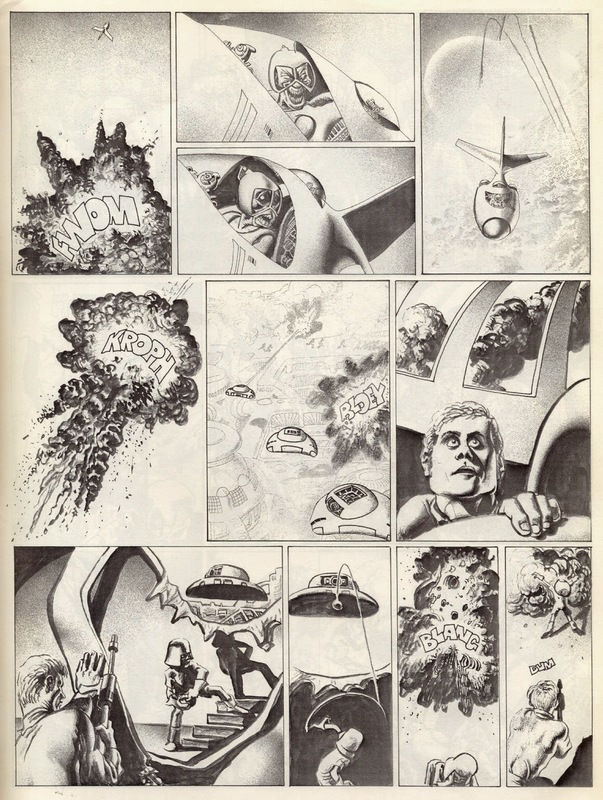 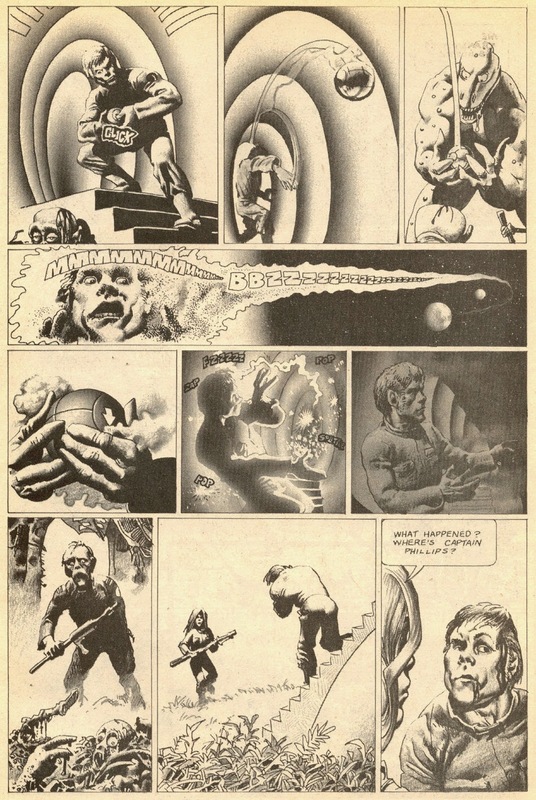 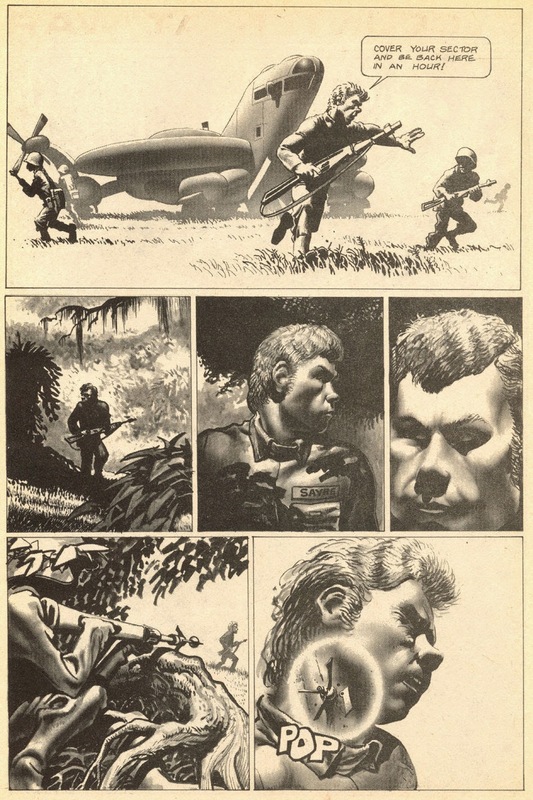 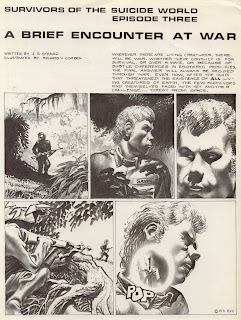 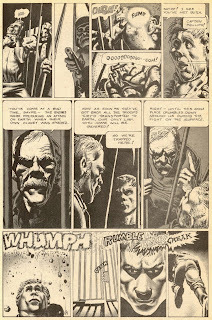 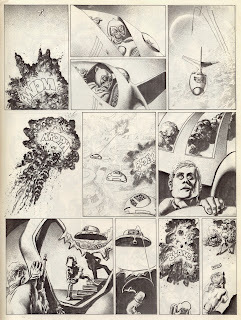 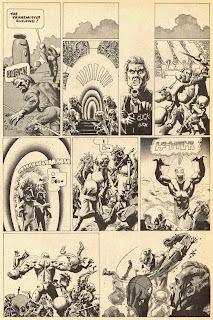 Just for the hell of it, here's two slightly different versions of the same story by Jan Strnad & Richard Corben. 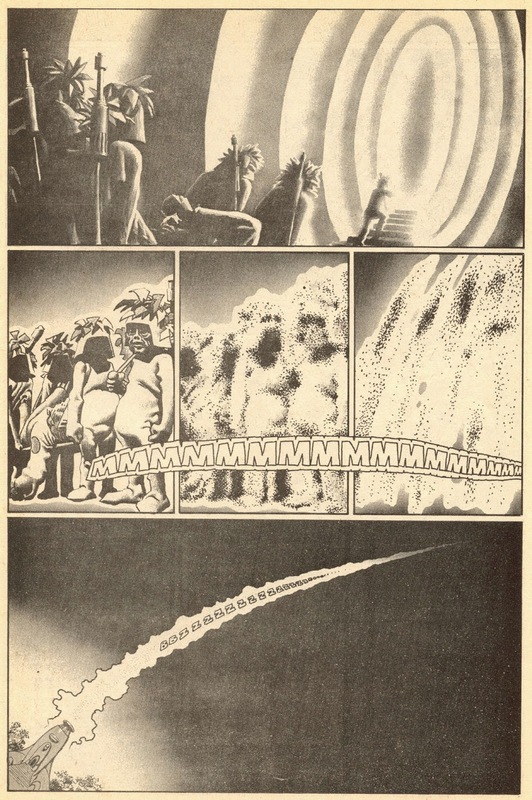 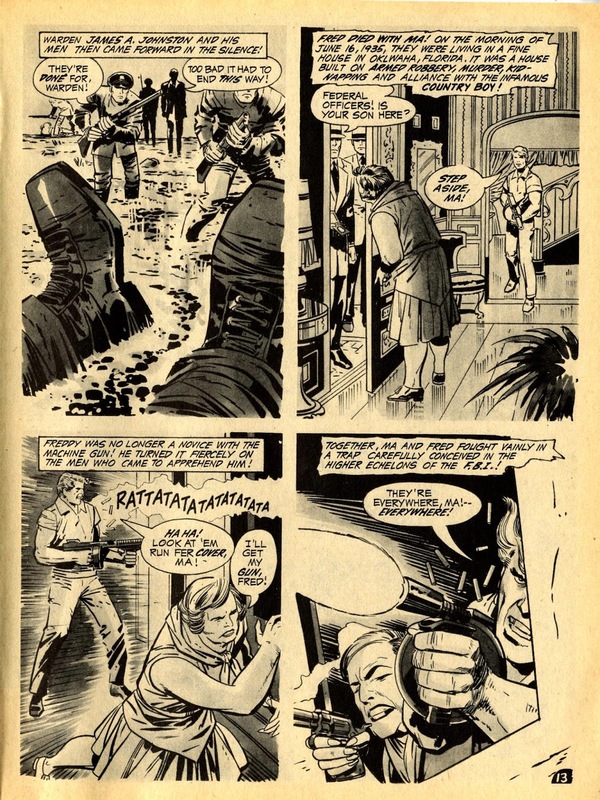 A Brief Encounter At War appeared in the 1971 issue of an underground called Anomaly and seems deliberately to suggest it's part of a larger epic, though there were no further tales in this setting that I'm aware of. And here's the rejigged version that appeared in the next issue of Anomaly, a year later. It's certainly a tighter version in terms of the story, though you still wish there was more, and could find out what happens to poor old Captain Phillips. 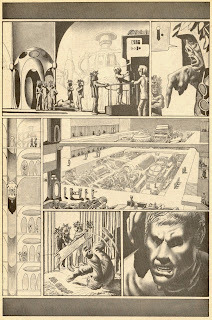 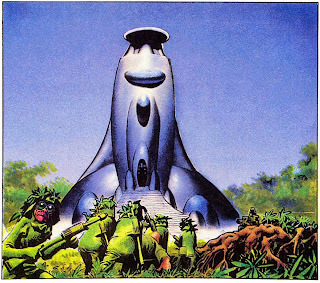 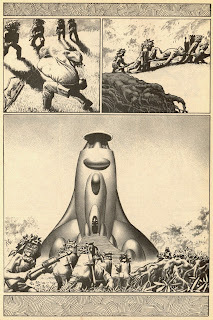 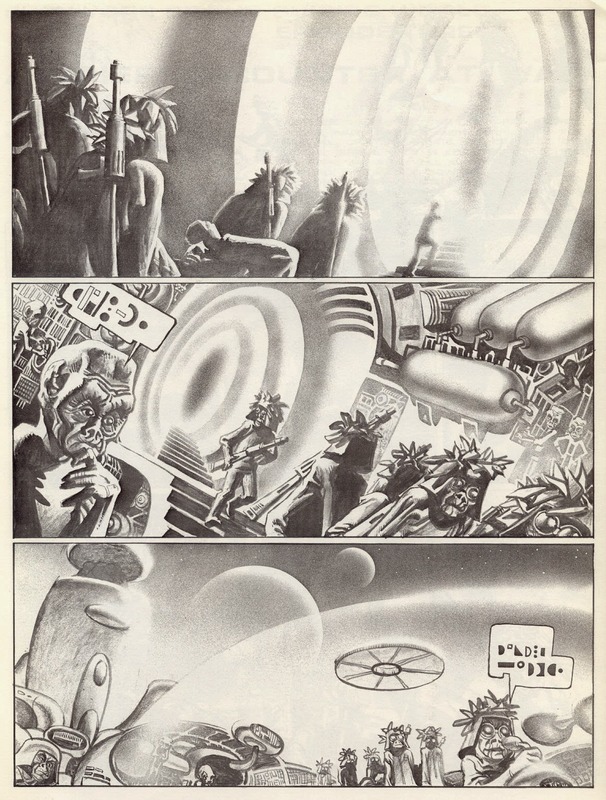 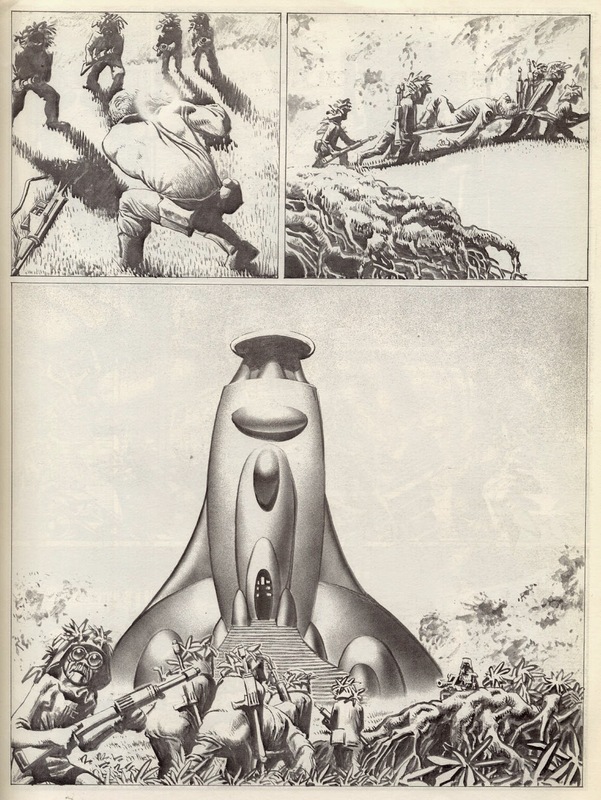 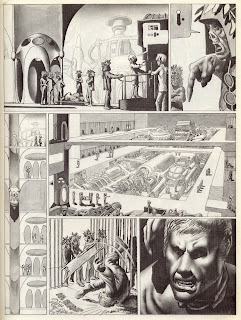 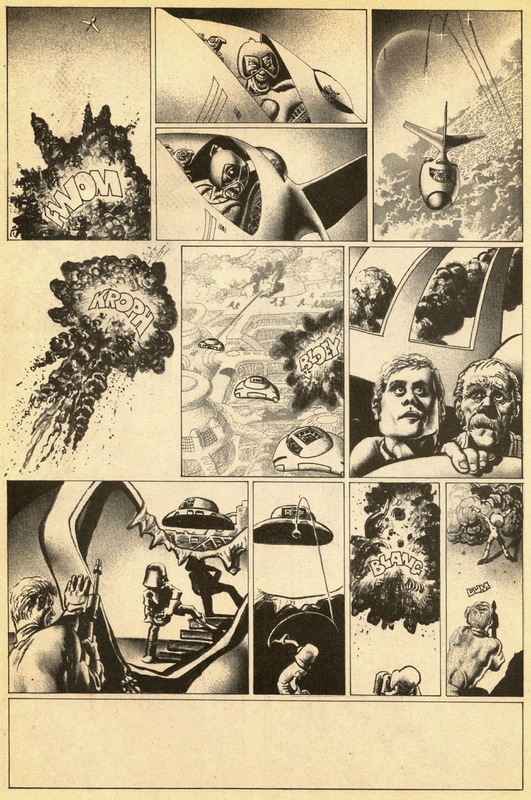 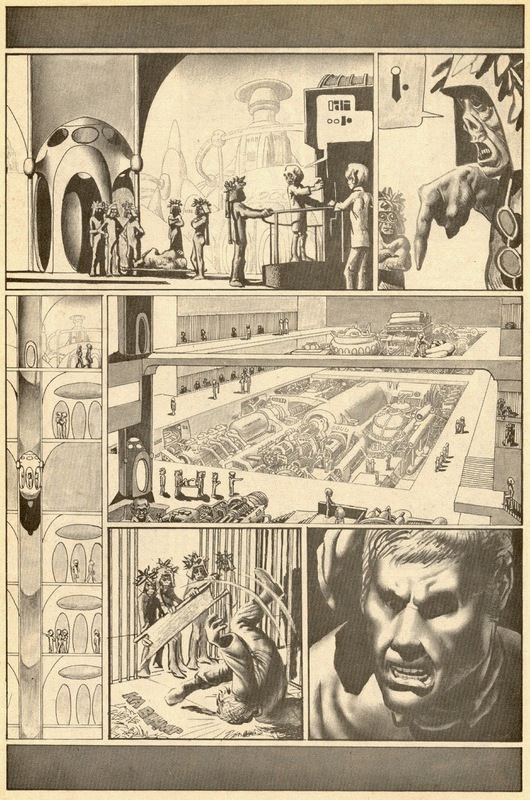 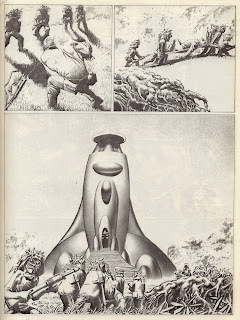 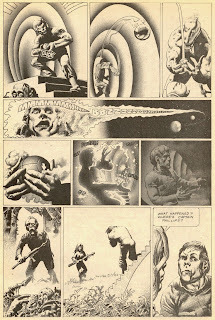 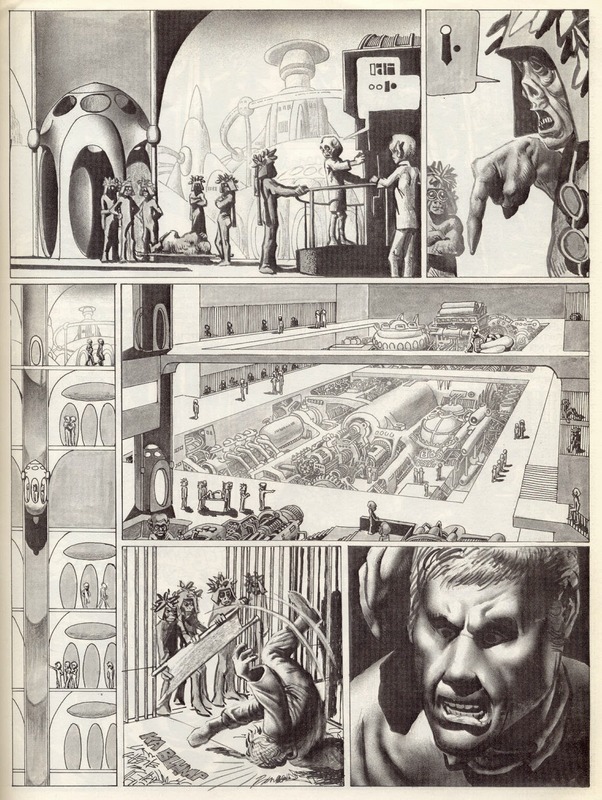 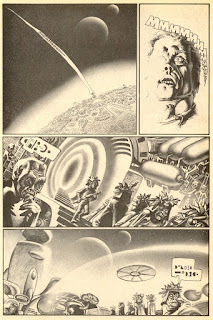 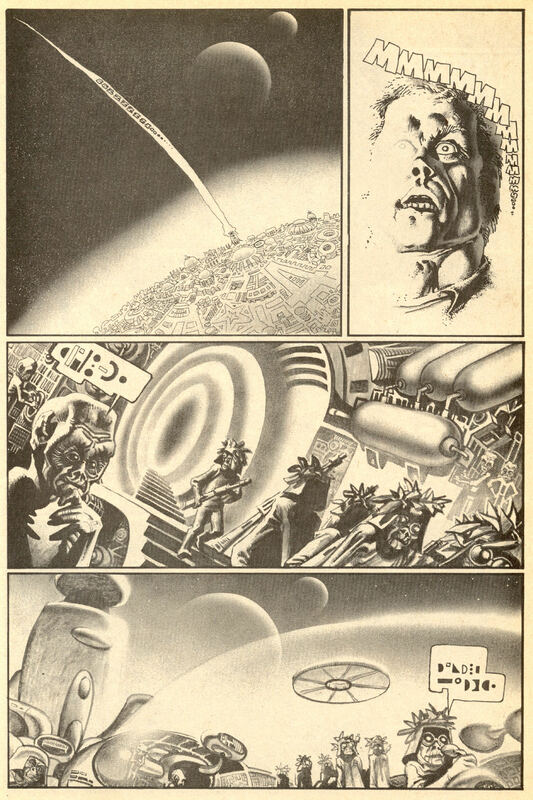 This version also made it's way into the 4th issue of Unknown Worlds Of Science Fiction, and years later, Corben coloured it and reprinted it in his own Den: Fantastic Adventures. 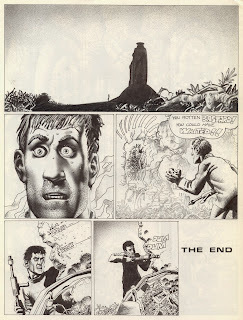 So it's a tale that's had a bit of a shelf life. Still want to know what happens next though. 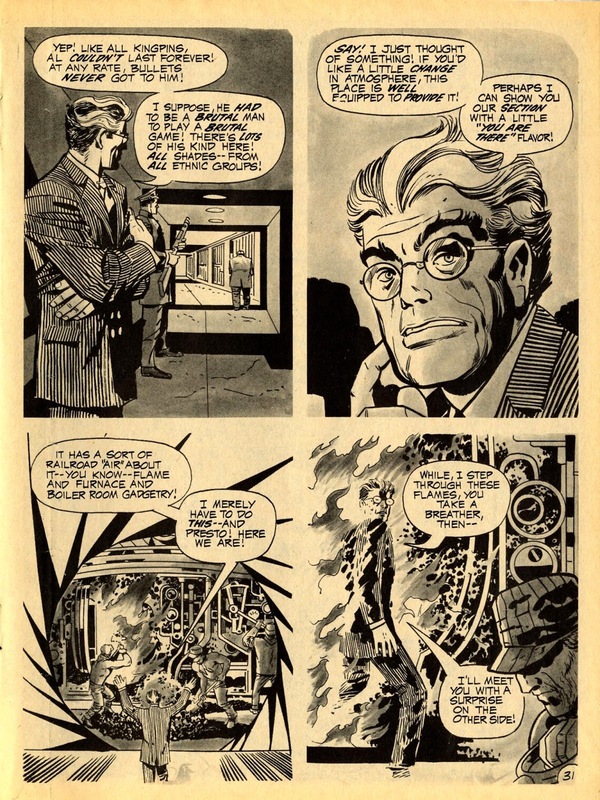 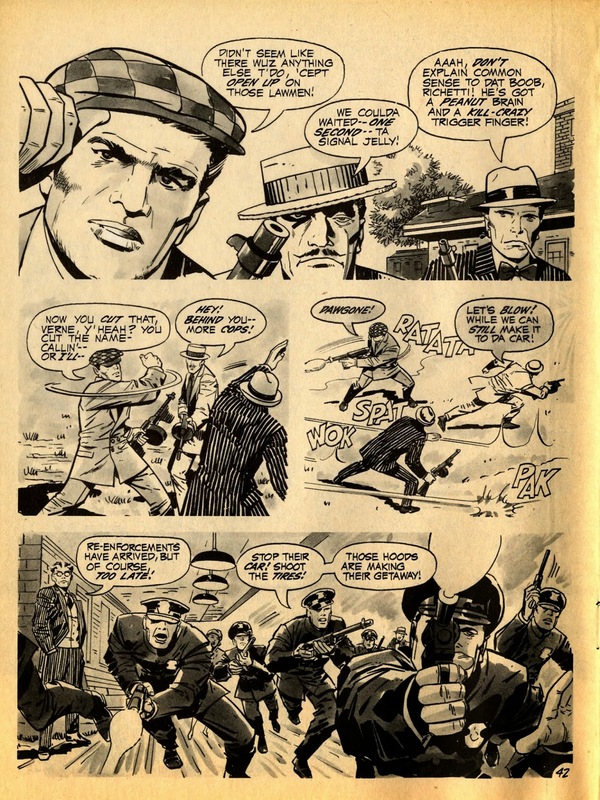 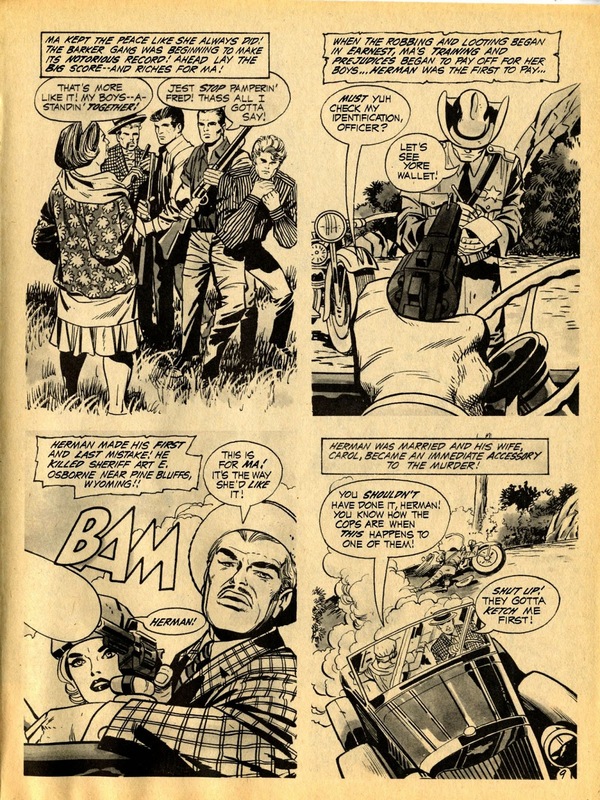 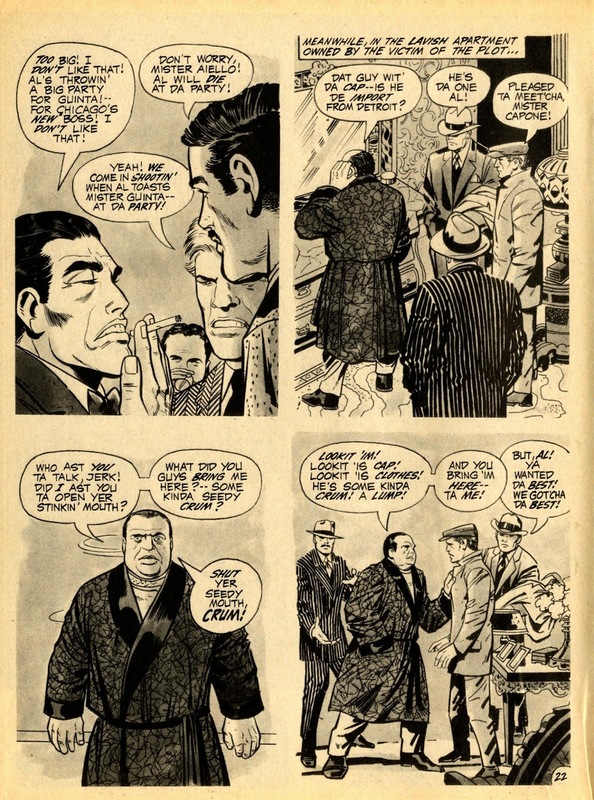 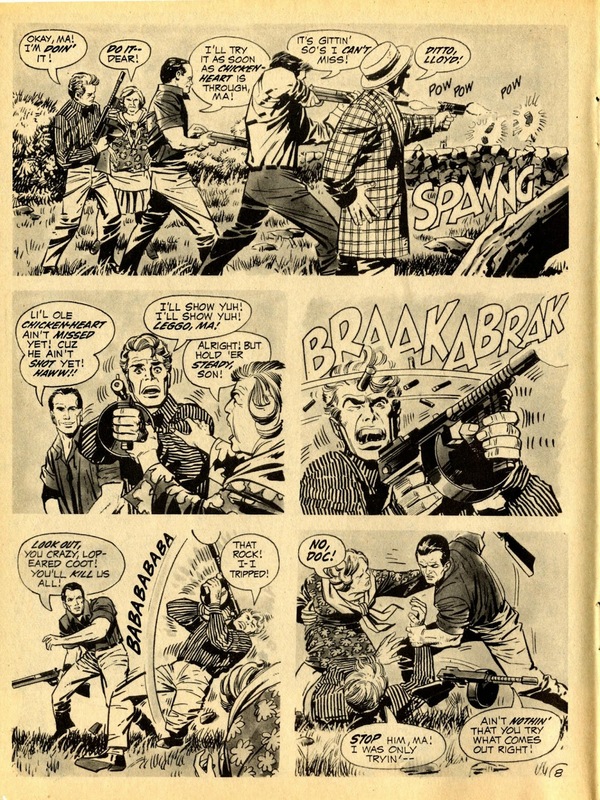 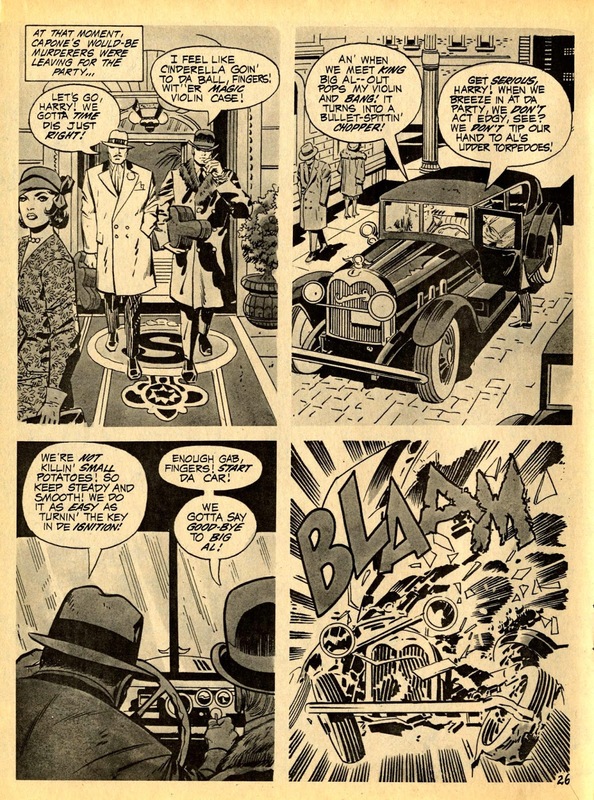 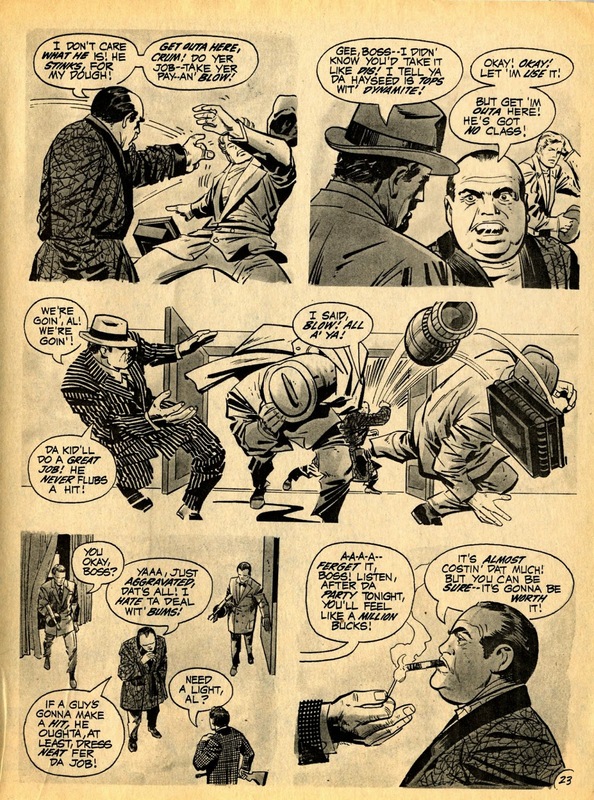 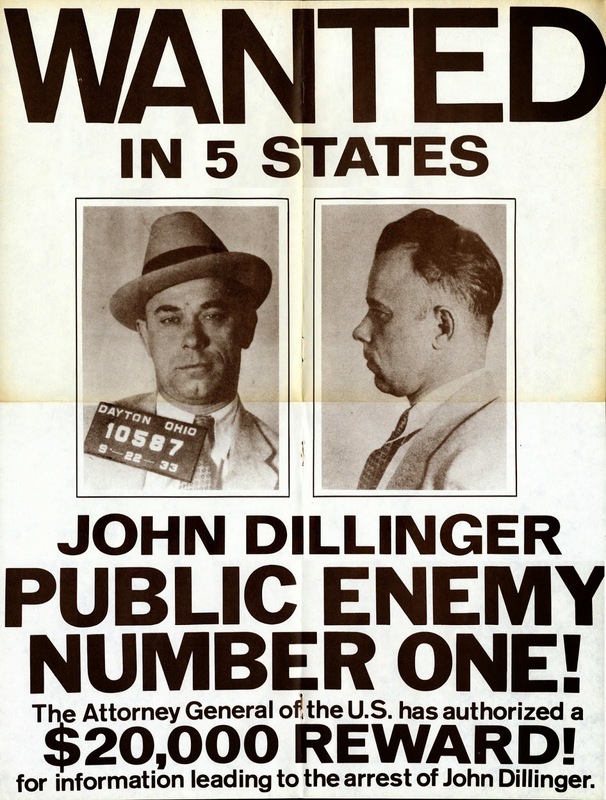 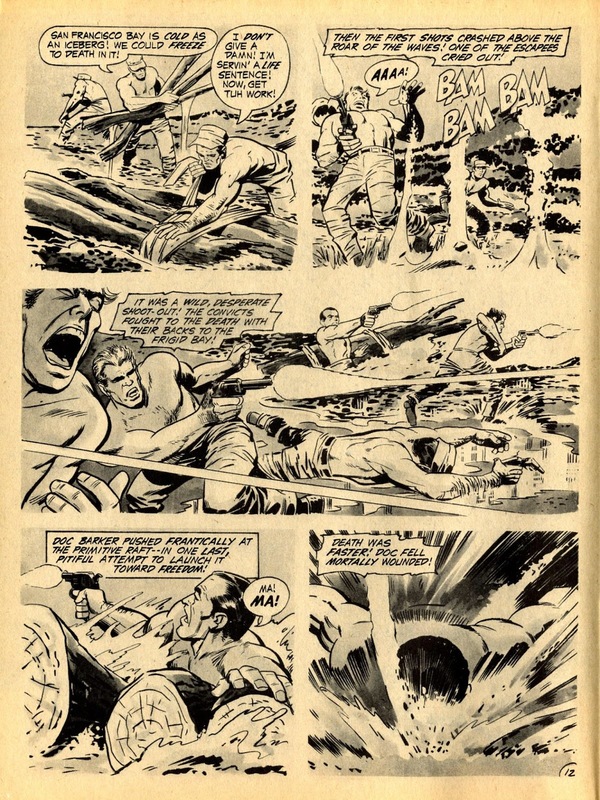 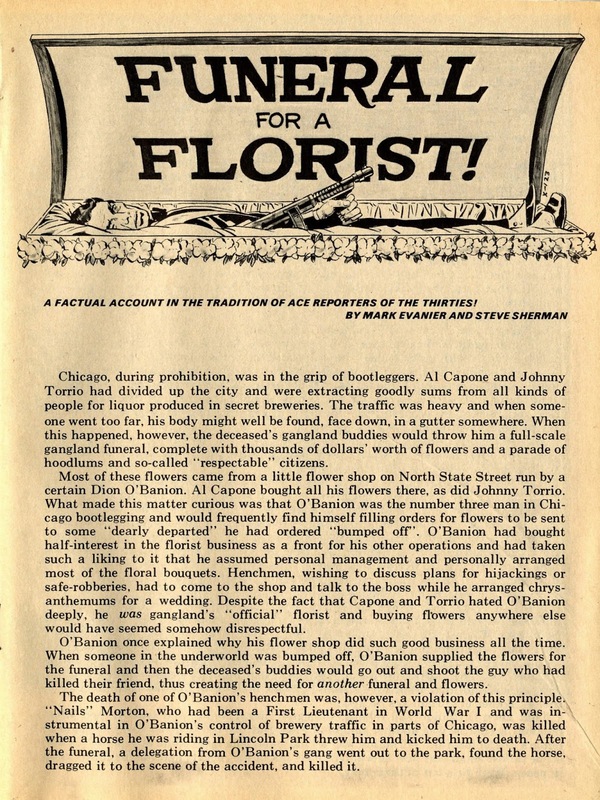 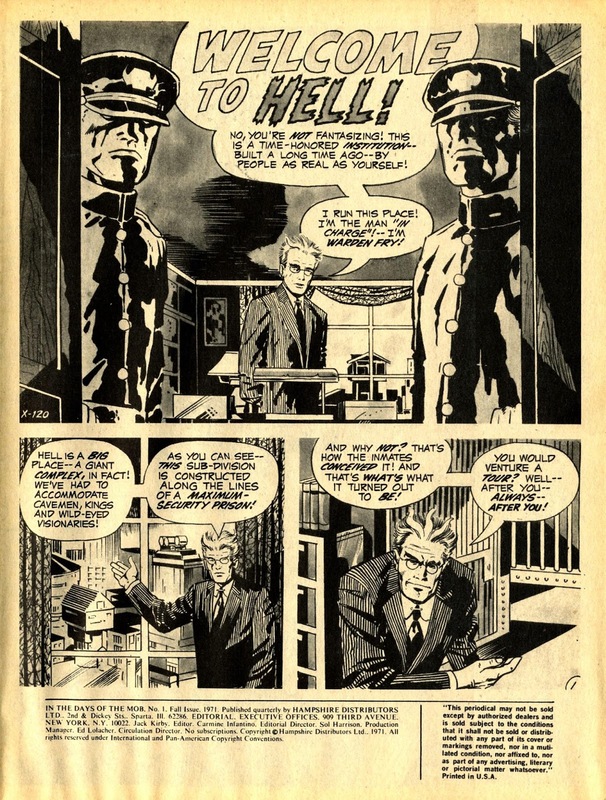 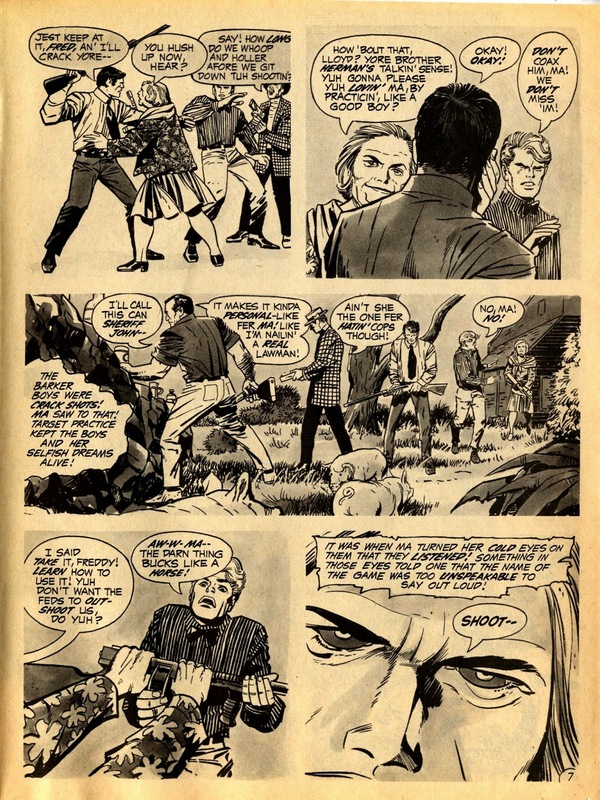 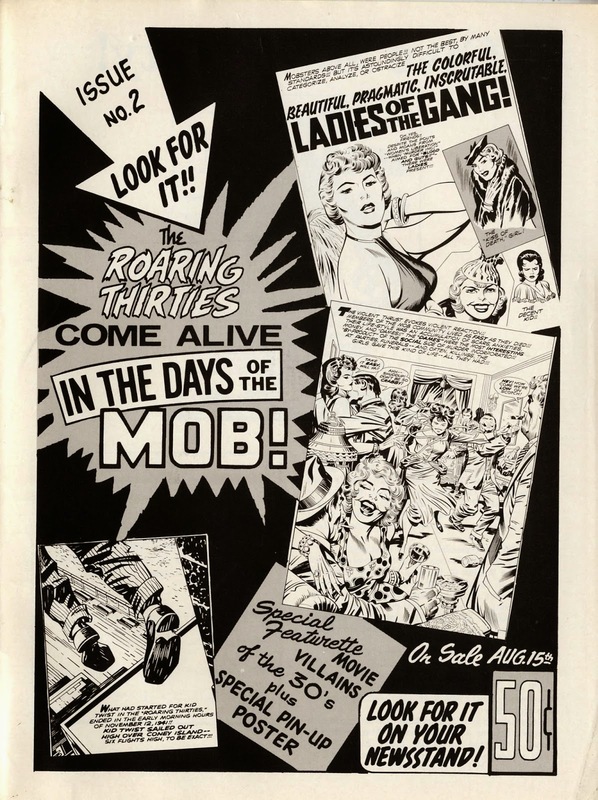 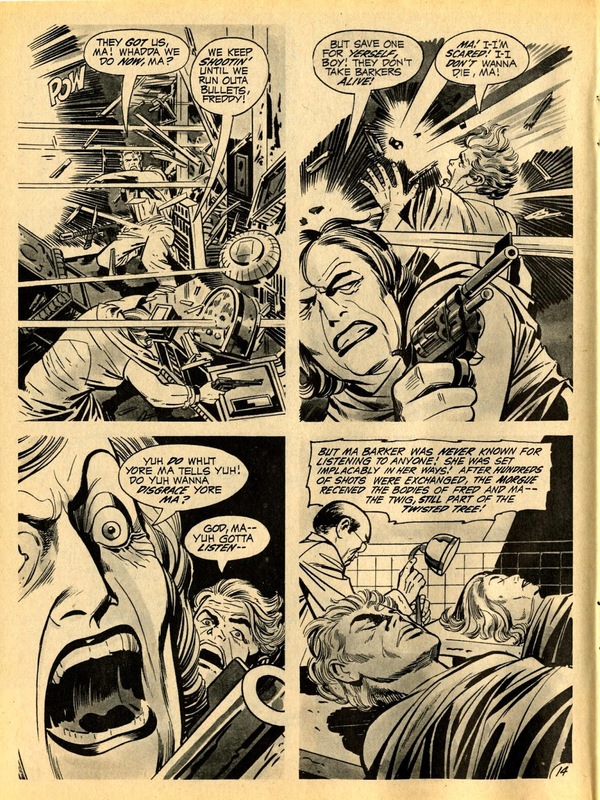 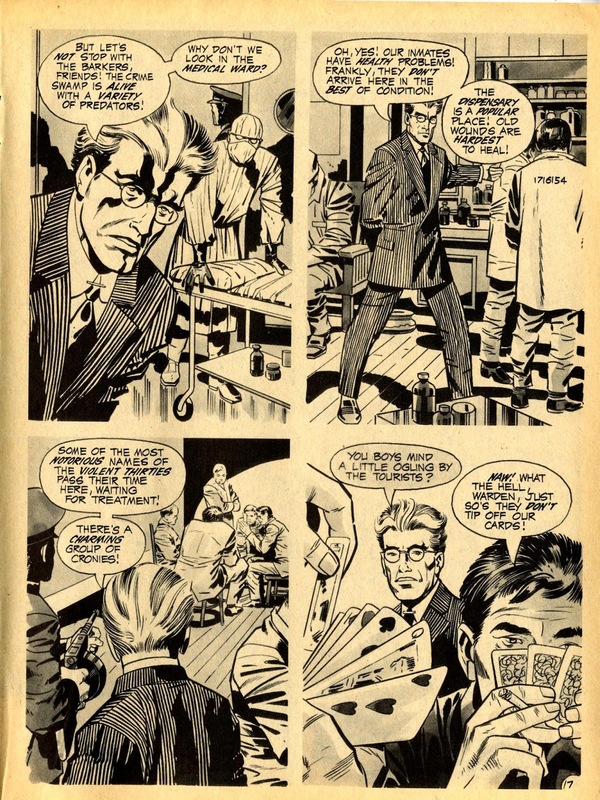 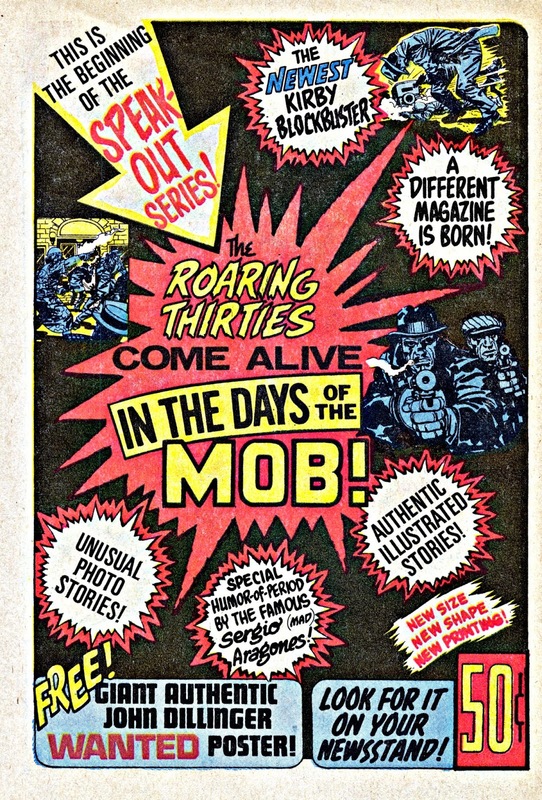 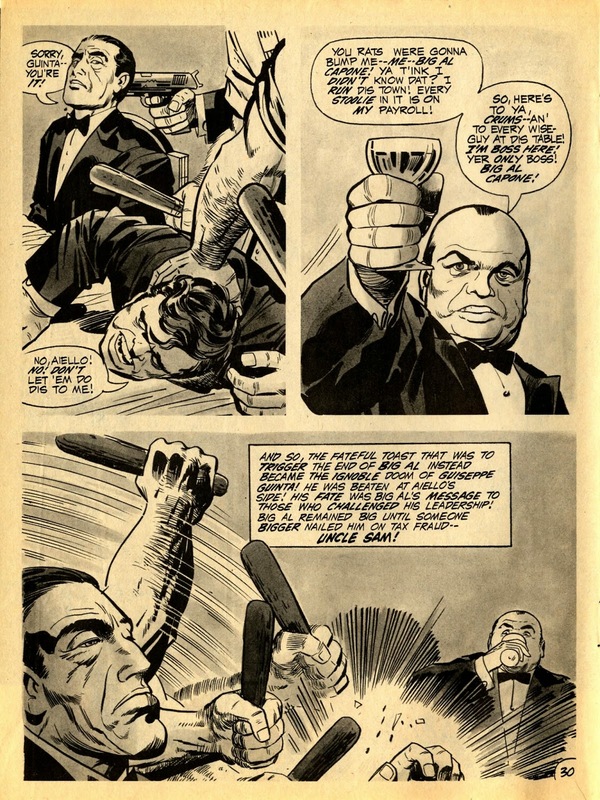 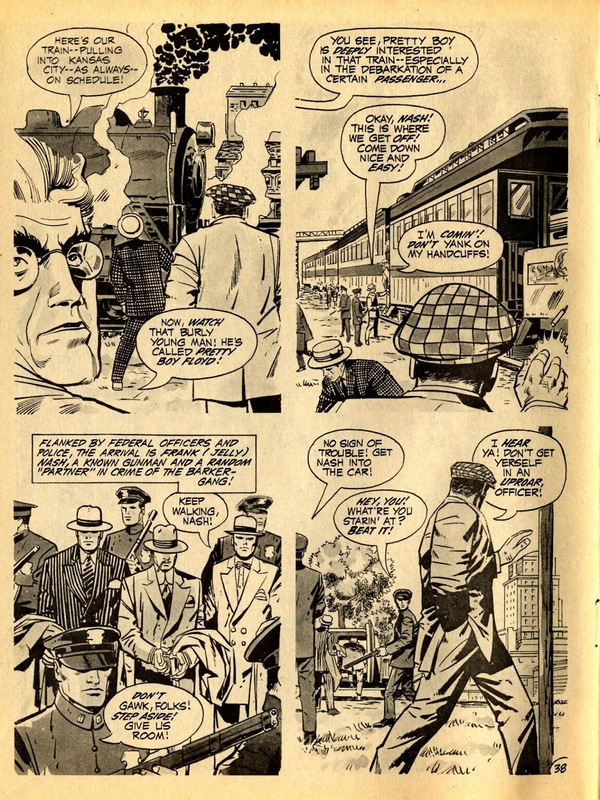 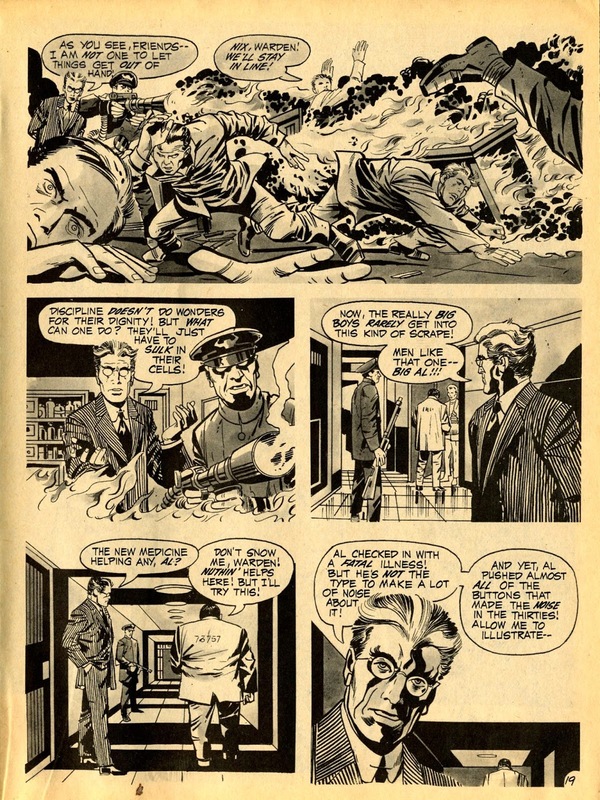 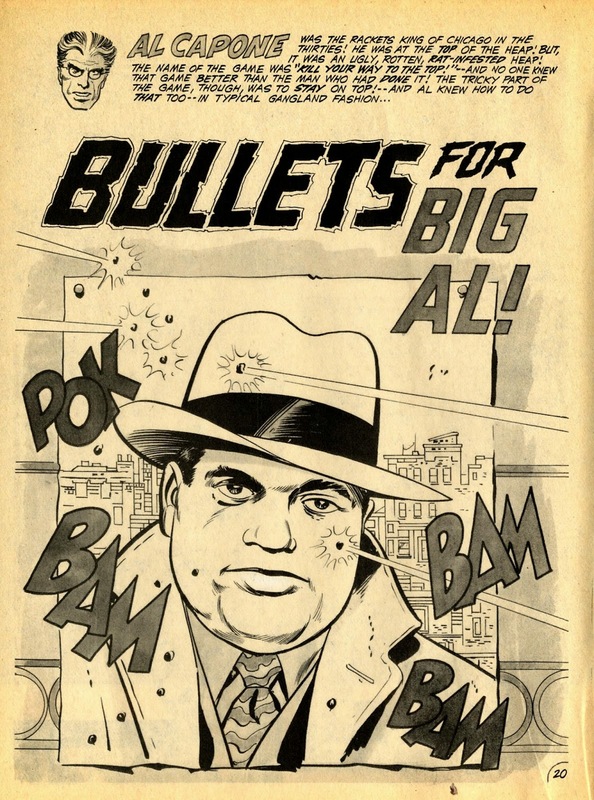 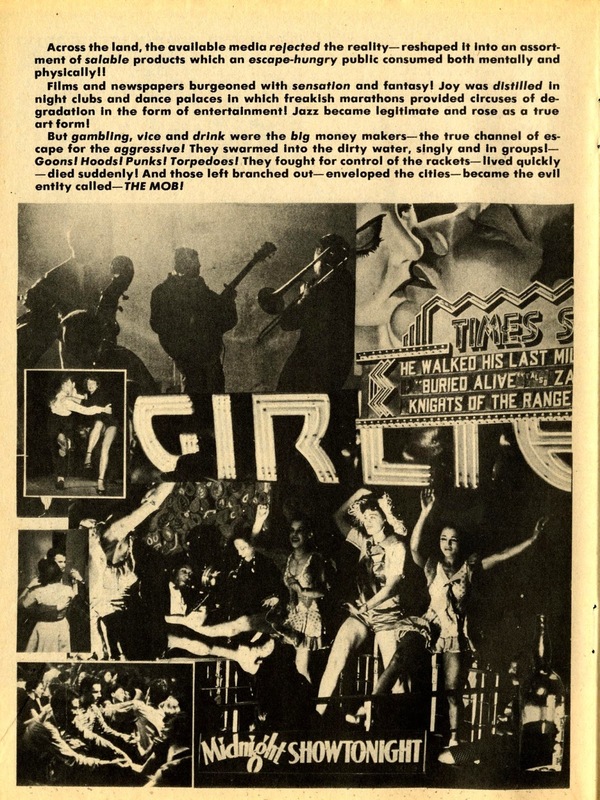 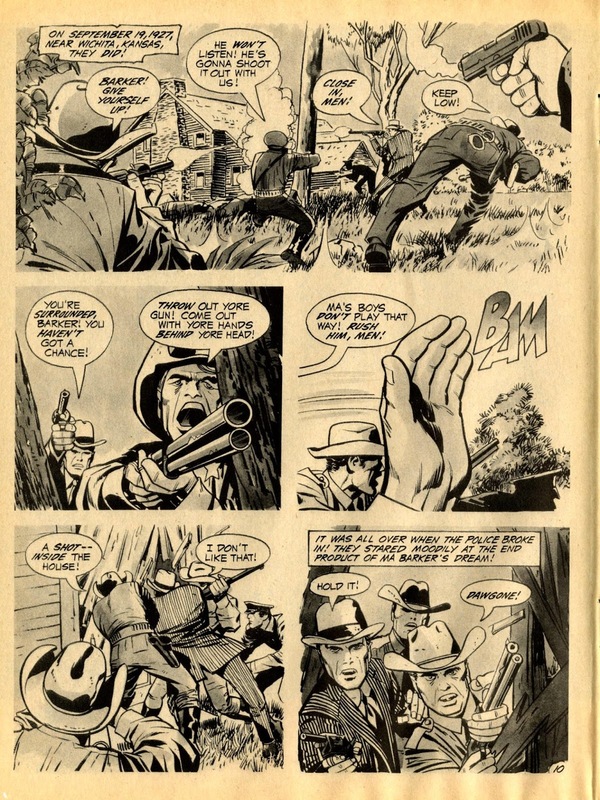 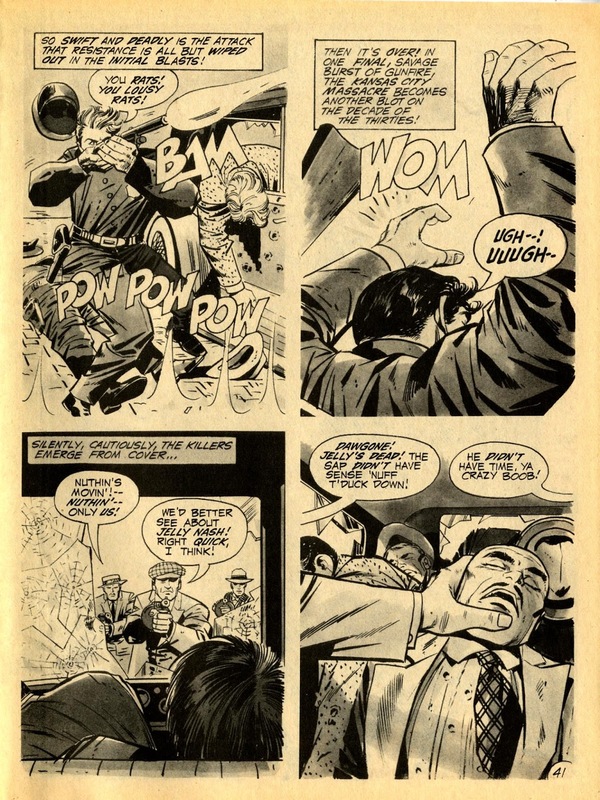 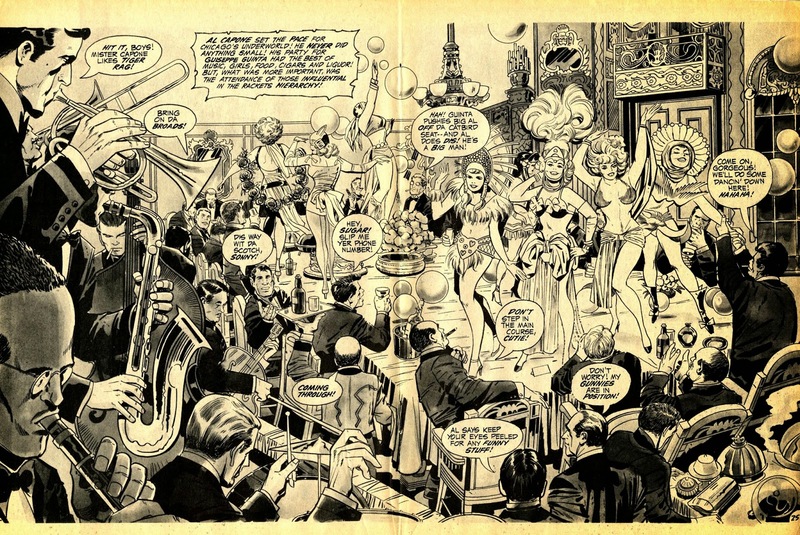 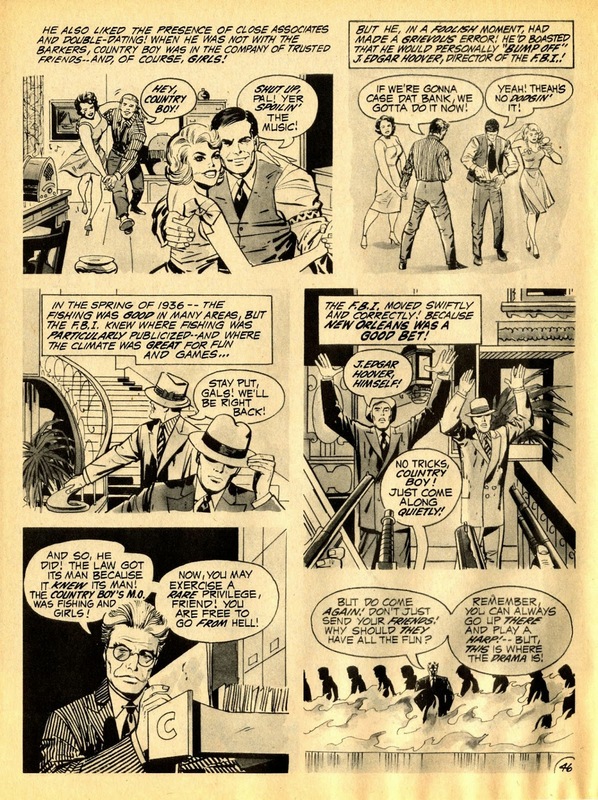 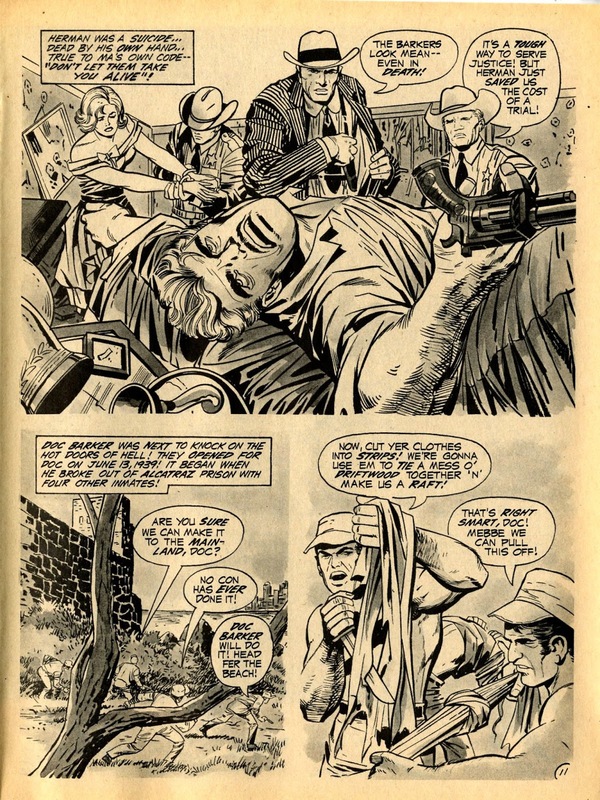 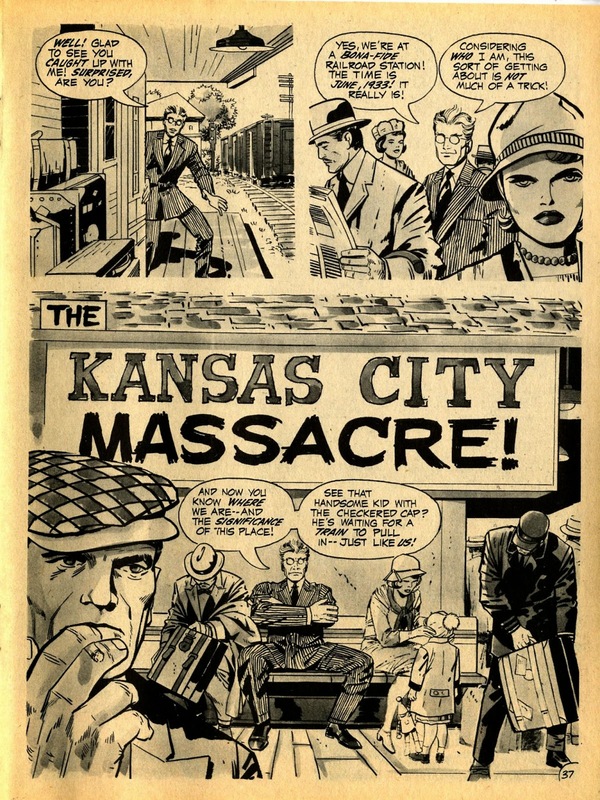 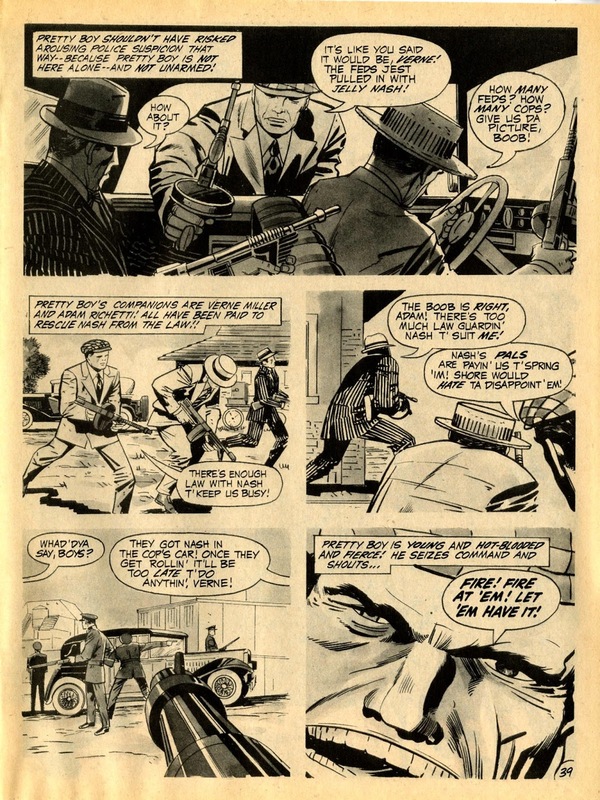 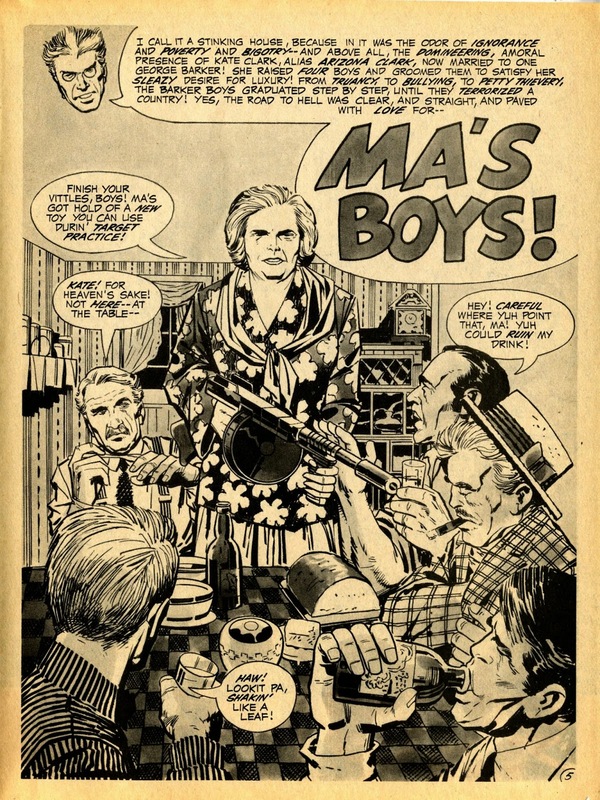 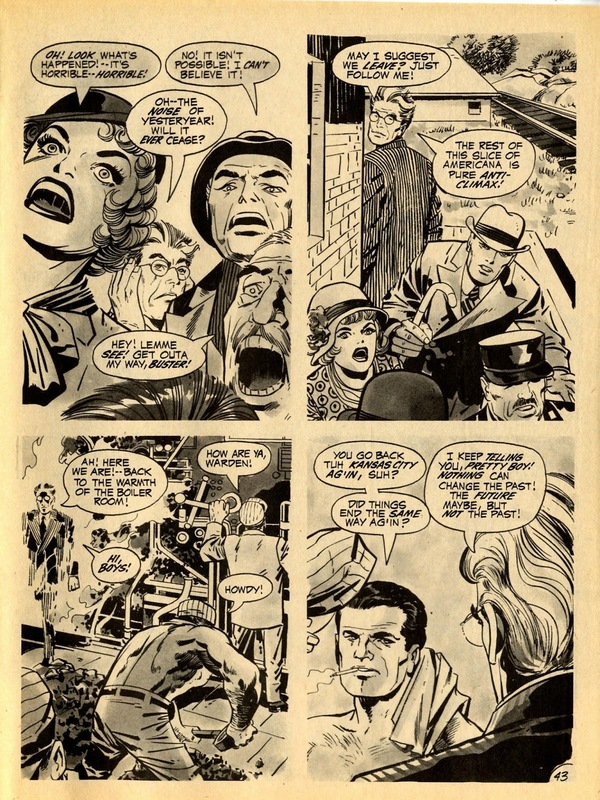 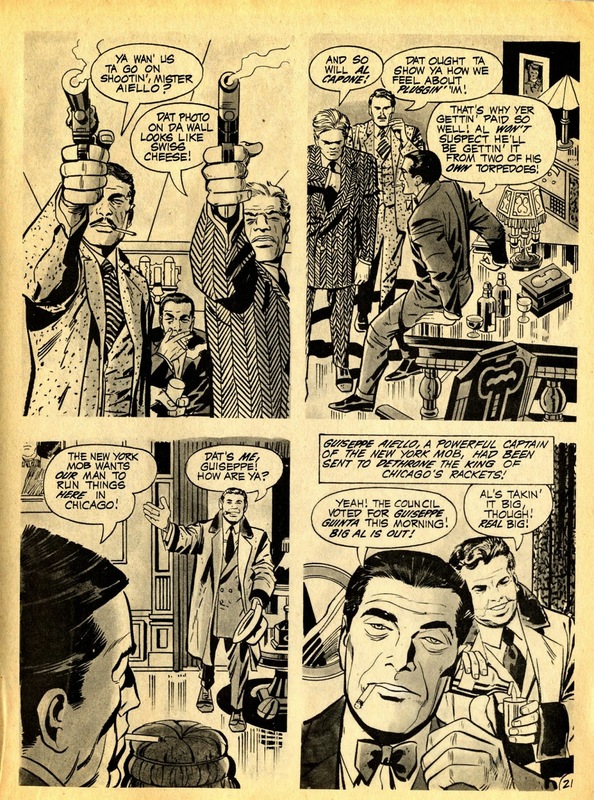 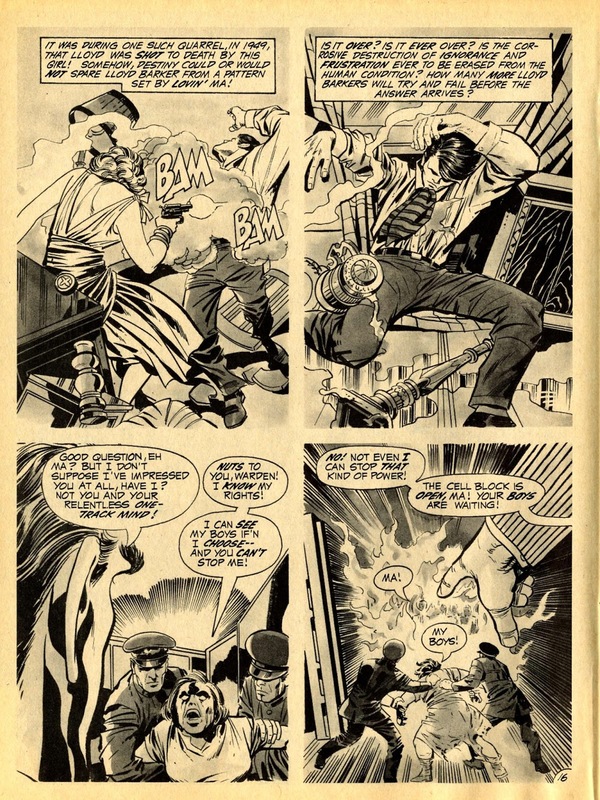 Jack Kirby's other go in the field of glossy comic magazines, alongside Spirit World, was the bullet blasting In The Days Of The Mob. 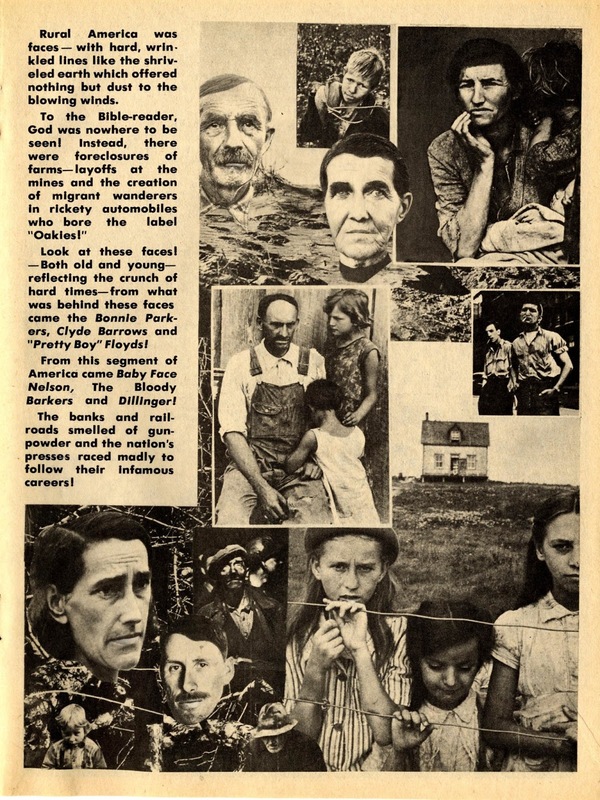 ( There was also the unfinished Soul Love and True Life Divorce Cases, but more about them another time ). 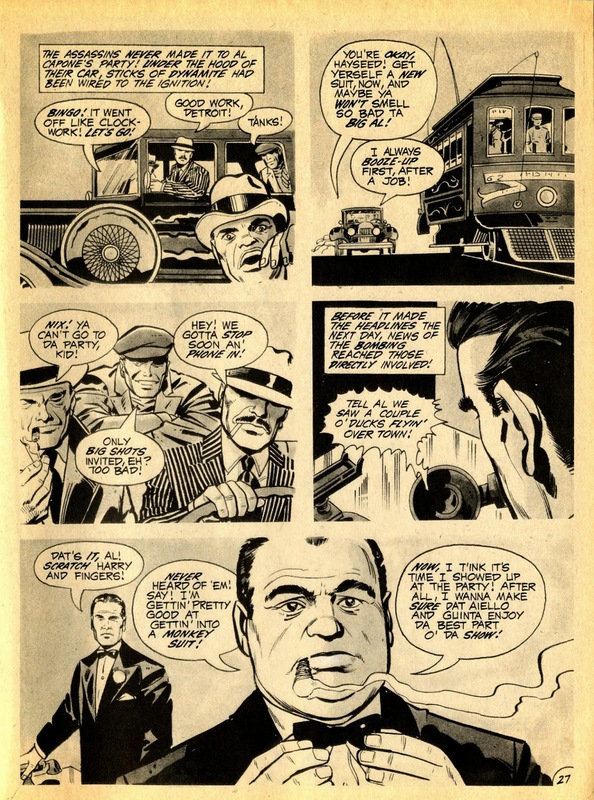 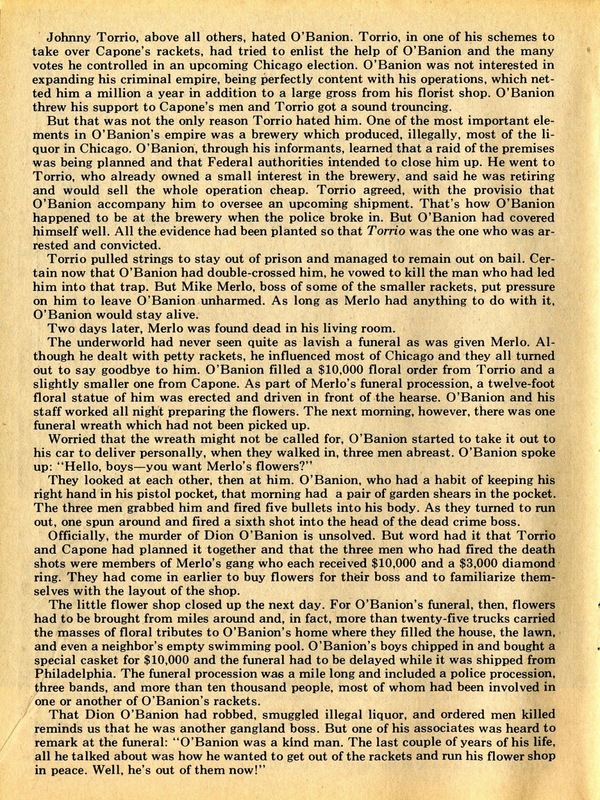 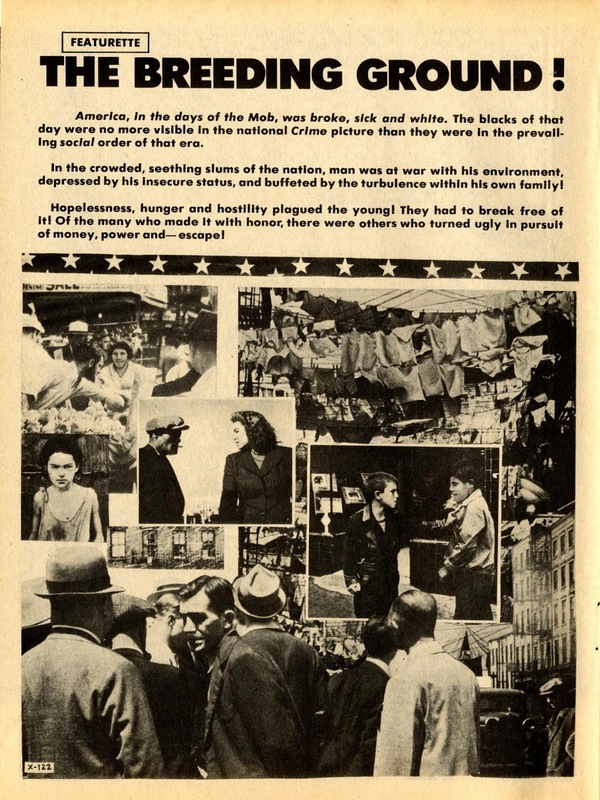 In as much as Spirit World was direct from Jack's mind, In The Days Of The Mob was direct from his life, and has the absolute ring of authenticity. 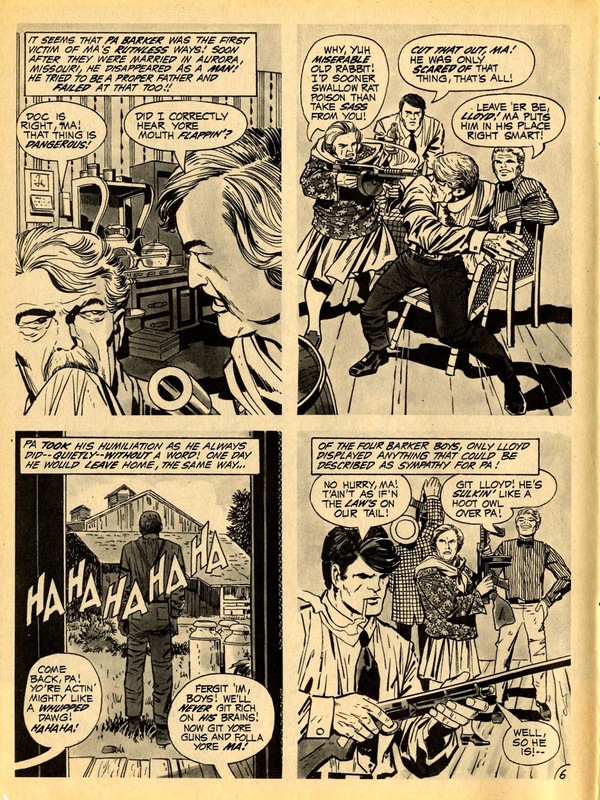 He lived through this era, and these were his formative years. 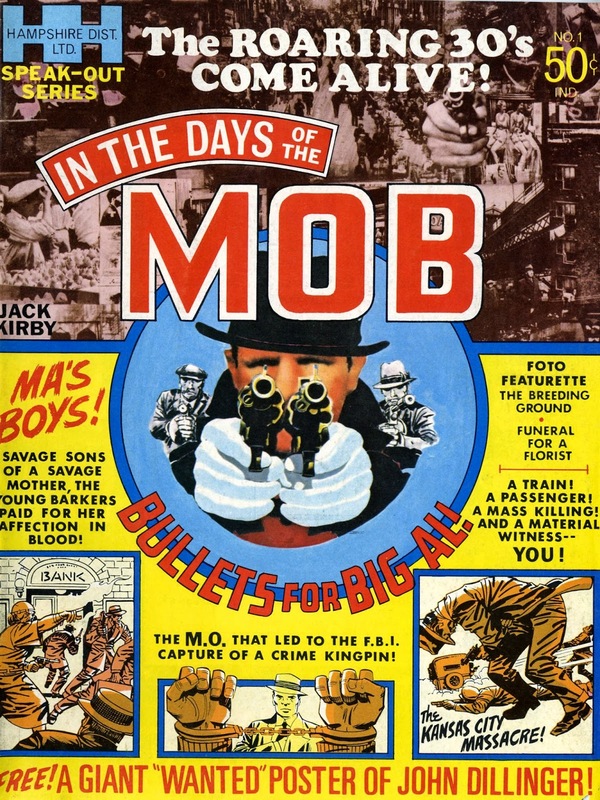 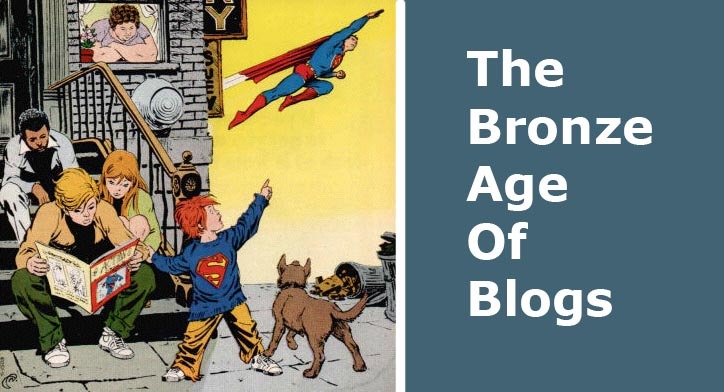 Running with street gangs in the tenements as a kid, gangsters were everywhere, and Kirby would have known people just like the real life villains in this book. 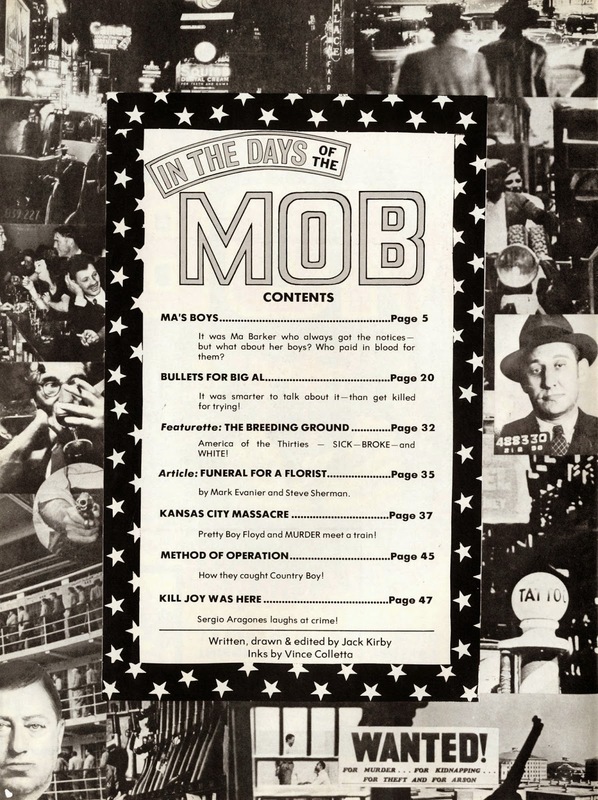 In The Days Of The Mob literally takes place in Hell, as The Devil gives us a guided tour of his domain and the misguided souls who made their way there in life. 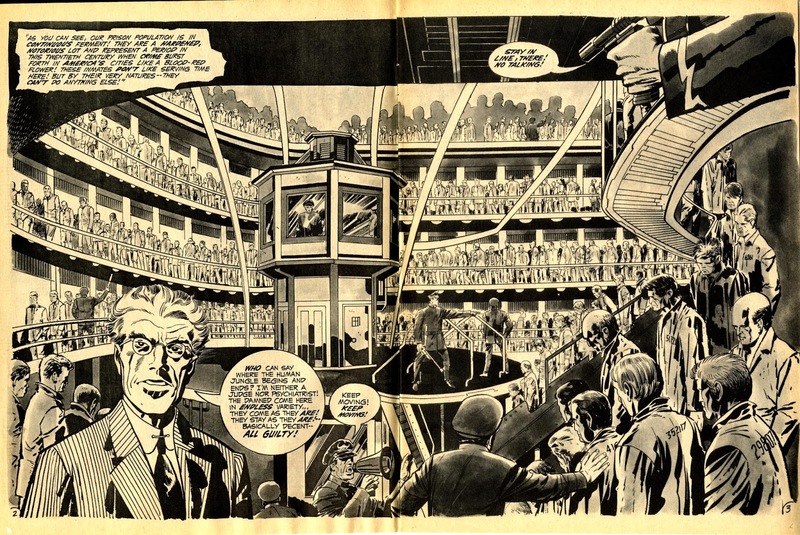 It's a visceral, strident book that doesn't let up till the last page, and we'd have loved it at the time, if DC had bothered to publicise or distribute it. 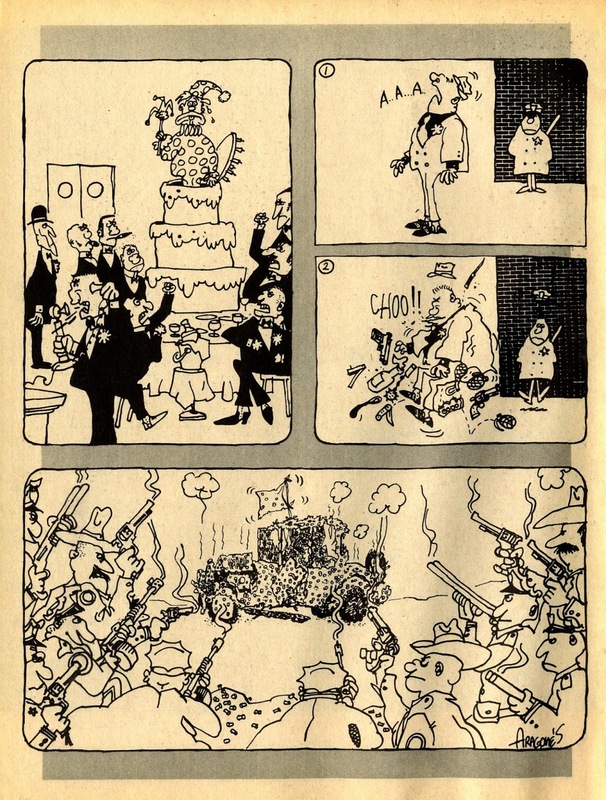 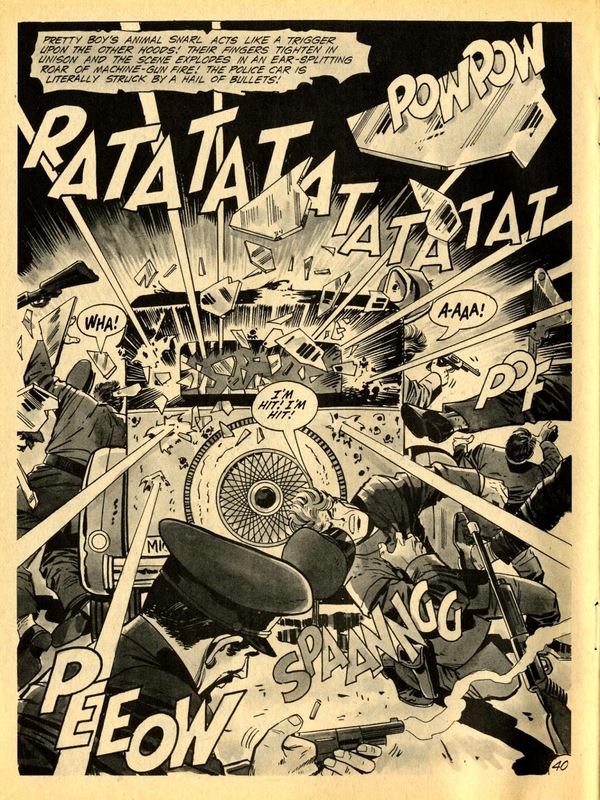 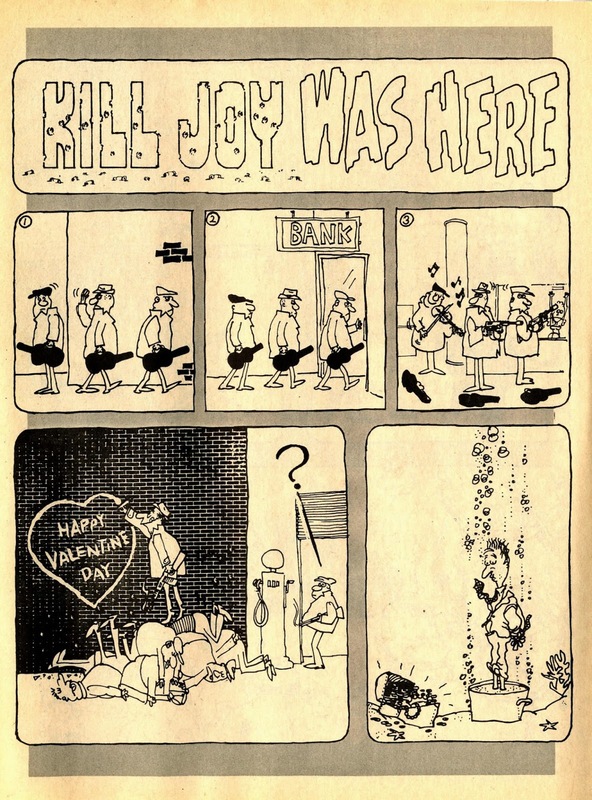 In fact, by the time you get to Sergio Aragones gag pages ( obviously Plop! outtakes ) at the end, you're exhausted. 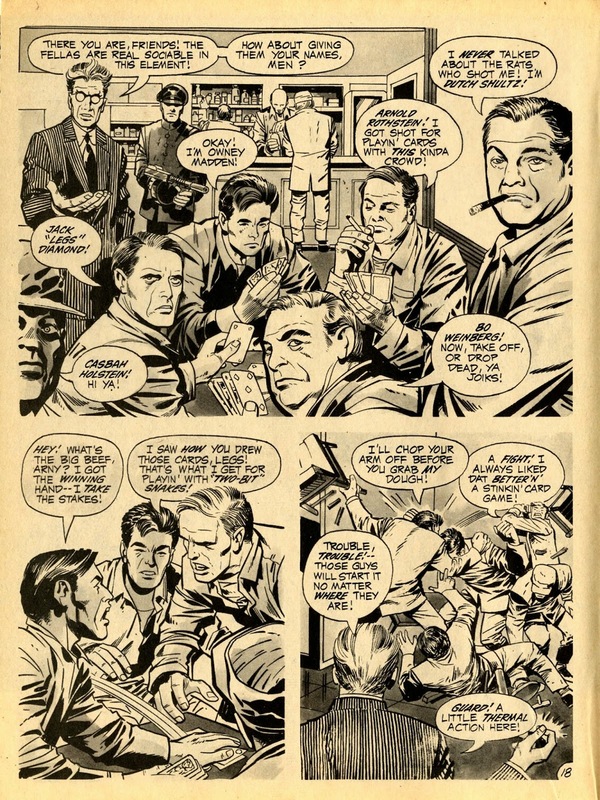 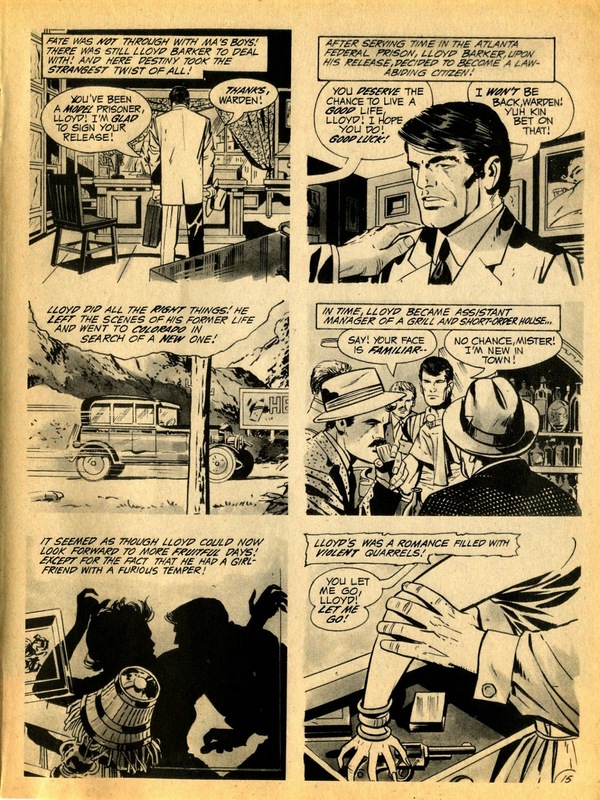 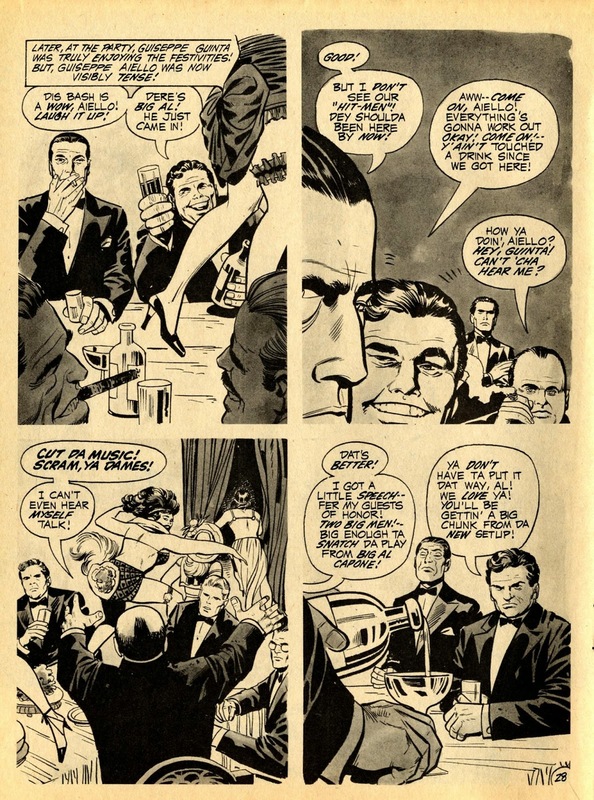 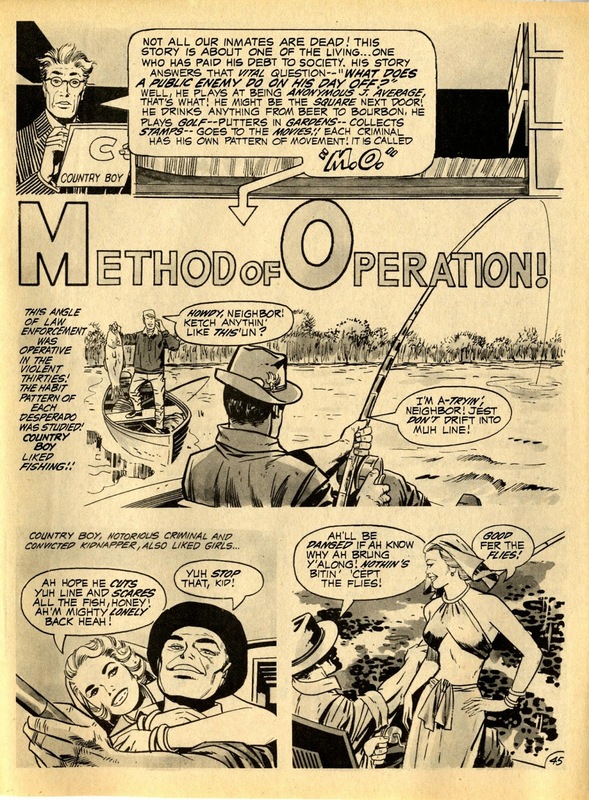 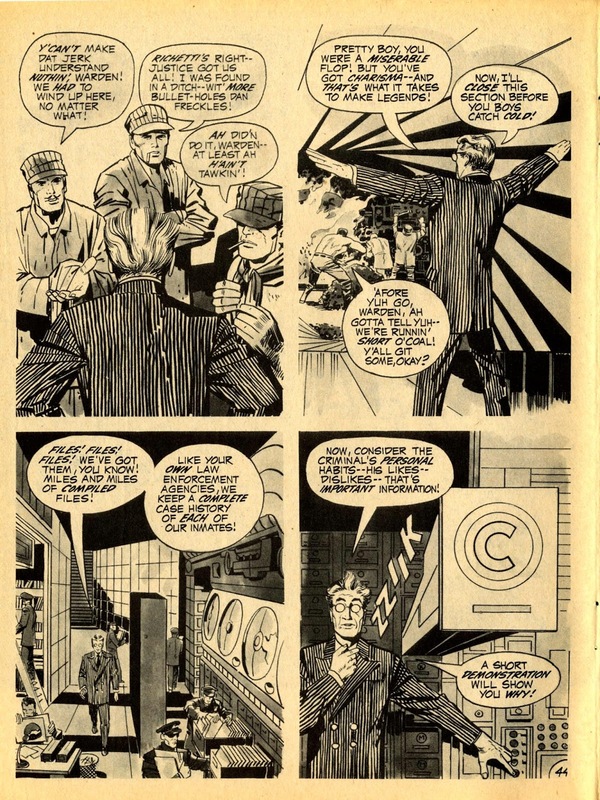 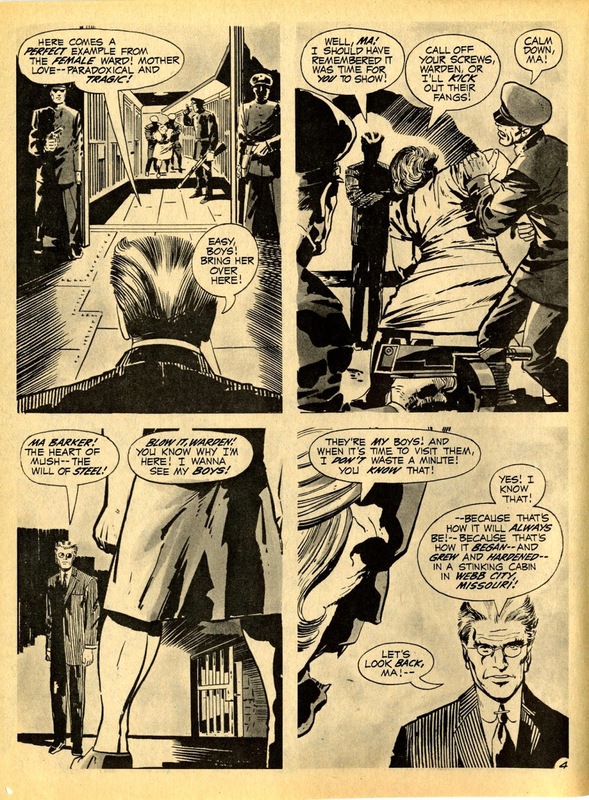 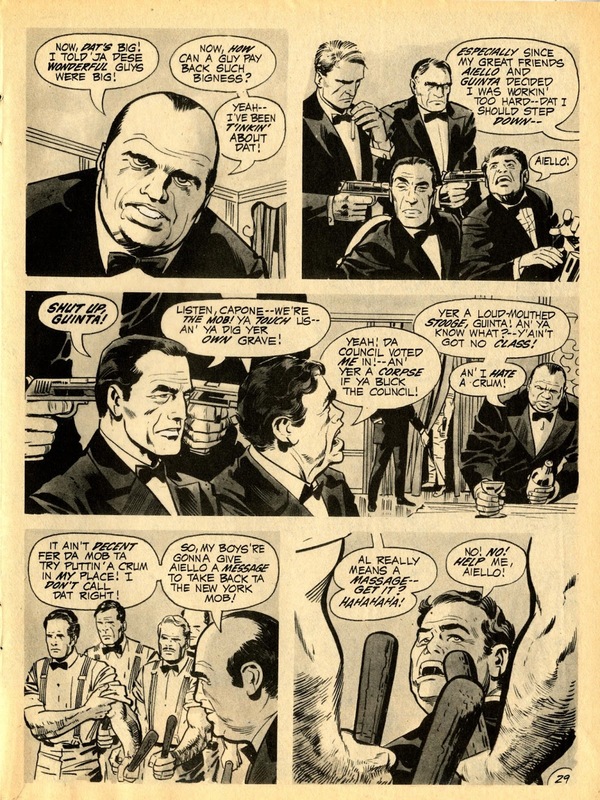 Vince Colletta inks throughout, and for once takes more than a weekend doing it, so Jack's detail and backgrounds are still in place, and all told the whole thing is a prettty wild ride. I'm off to see what I can locate of the unpublished ish 2, enjoy yerselves, ya crumbs.